CRISP SOUND, with clear bass resonance, CVC wind noise reduction, and superior sound isolation delivers your favourite music without compromise! - Lightweight design, you won't even know they are there! - MULTIPOINT PAIRING, for those of you who like share! 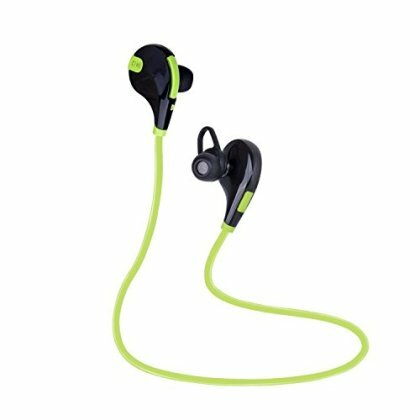 SWEAT RESISTANCE & STAY IN EAR WIRELESS TECHNOLOGY, perfect for running, gym, climbing, winter sports, driving, skating or any other activity where you want to lose the cables! - EASY "ON-EAR" CONTROLS, providing ease of use when on the move! HANDS FREE CALLS, built in microphone to allow you to take calls on the move. Voice command for picking up / rejecting calls - - OPERATIONAL TEMPERATURE -10 TO 50°C, don't let the extreme cold on the mountain jeopardise your music! SIMPLE TO PAIR CSR BLUETOOTH 4.1, compatible with all Bluetooth enabled devices, including all IOS, android phones and tablets. - UP TO 10 METRES OPERATING DISTANCE, So put your device somewhere safe whilst you train!